Michael says he likes these better than the banana flax pancakes I usually make. In a medium bowl, mix together almond flour, cream cheese, eggs, ground flax and vanilla until smooth. I have a non-stick grill to make these with. If you don't have one, use a nonstick skillet over medium heat, melt 1 tablespoon butter. Pour in about 3 tablespoons batter and cook until golden, 2 minutes. Flip and cook 2 minutes more. Transfer to a plate and continue with the rest of the batter. 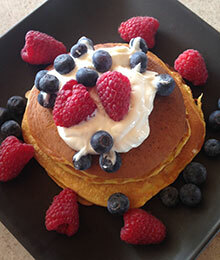 I served with fresh berries and stevia sweetened Greek Yogurt.... Michael added maple syrup to his. You can also add blueberries to the batter. I did that the 2nd time I made them! yum!